Hemp Seed Moisturizing Oil Spray in Dreamsicle from Earthly Body will make all of your skin's dreams come true. 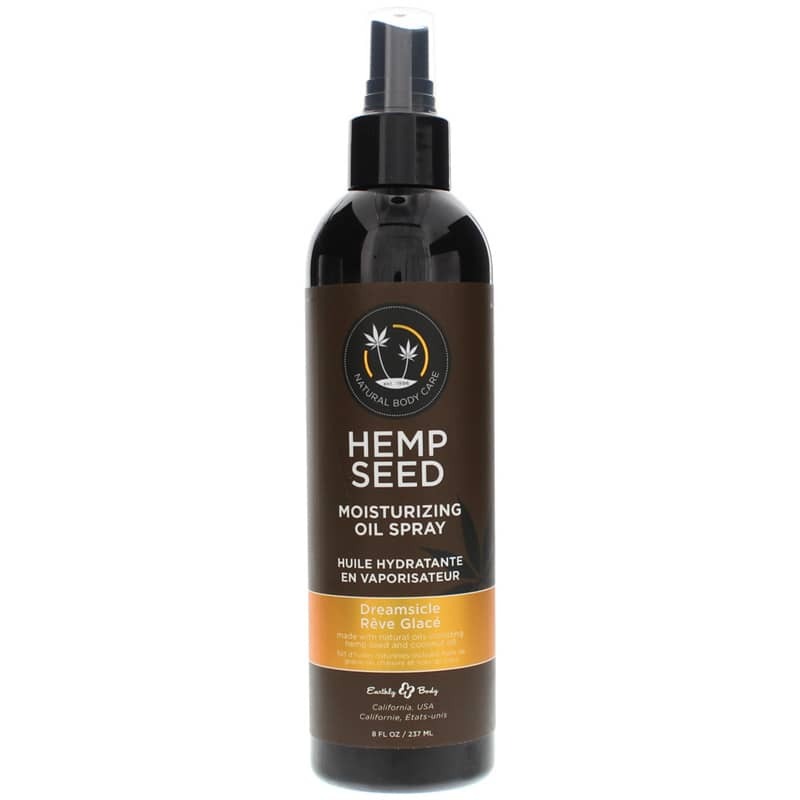 An all-natural and convenient, mess-free, spray-on moisturizer with hemp seed and other nourishing oils, Hemp Seed Moisturizing Oil Spray is a must! Moisturizing oils can provide intense moisture for dry skin or take a massage to a whole new level. But, they can also be messy. Earthly Body solves this dilemma by giving you the super-nourishing oils you want in an easy-to use spray for no more spills! Just spritz your way to soft and oh-so-touchable skin. 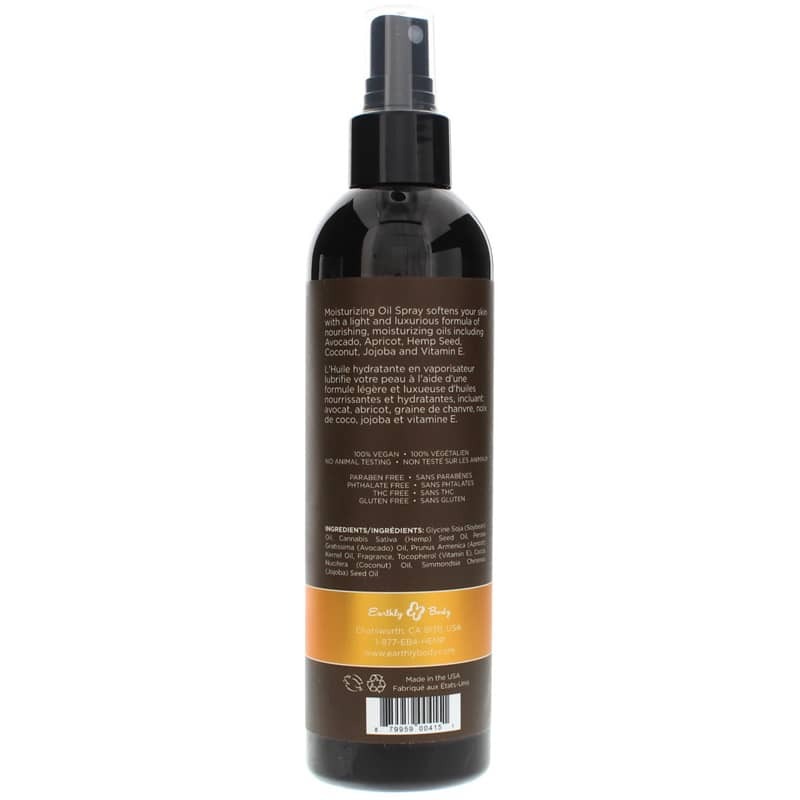 Hemp See Moisturizing Oil Spray is made with the finest, most nourishing ingredients available, including hemp seed oil. Renowned for its skin-rejuvenating properties, hemp seed oil is excellent for soothing dry, irritated skin. It also contains NMF, or Natural Moisturizing Factor, which imitates the natural elements of healthy skin. This allows it to penetrate deep into the lipid layer of cells for intense moisturizing, and also prevents the evaporation that causes dryness. Use like an ordinary moisturizer. Spray it on and rub it in. Use after refrigeration for a cool refresher on a hot day. Warm it in the microwave a few seconds to heat up a cold night or soothe achy muscles. Use it with your sweetie for an intimate - mess-free - massage night. Stop dreaming about the perfect pampering experience and start living it! Order Hemp Seed Moisturizing Oil Spray in Dreamsicle today! Glycine Soja (Soybean) Oil, Cannabis Sativa (Hemp) Seed Oil, Persea Gratissima (Avocado) Oil, Prunus Armenica (Apricot) Kernel Oil, Fragrance, Tocopherol (Vitamin E), Cocos Nucifera (Coconut) Oil, Simmondsia Chinensis (Jojoba) Seed Oil. I bought a variety pack of these oils mad Skinny Dip is my fave! Honestly I use a lot of skin products to keep my skin glowing and this one just feels great and smells delish! It's fun too! ;) A must try! I want to buy the spray moisturizer just to use everyday. <br>Thank you! My arms have itched & I've scratched them til they bled. This is the first product that helped my skin. I use it daily and I rarely itch anymore.